• As your body heats up during exercise, especially your face, the warm and moist air rising from the face condenses into steam on the lenses of your glasses. 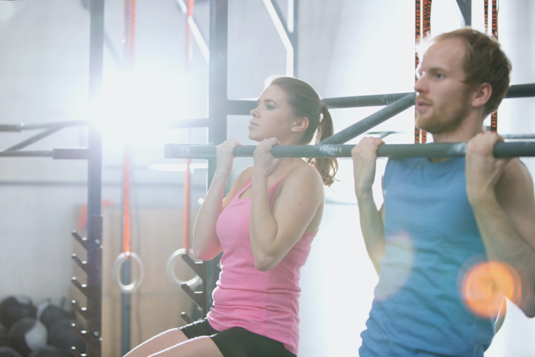 This restricts your vision and interrupts your workout session. • While doing burpees, tuck jumps, sprints and high-intensity exercises you are actually struggling to just maintain a normal breathing pattern. Wearing glasses during such forms of exercises means you also have to battle with the rhythmic bashing of your frames which jump up and down on your nose and eventually slide off. This causes a distraction and you may injure yourself because of a shift in your concentration. • You only get an idea about the capacity of your nose to sweat when you workout. And yes, it can sweat a lot. This, in turn, makes your nose slippery and as a result, your glasses can easily slide off. It becomes hard to push them back immediately if your hands are busy lifting weights. • The frames of your glasses obstruct your view when you look up, down and side to side. As a result of this, you have to move your entire head rather than just your eyes. This can become very distracting when you are trying hard to focus on maintaining the right form for any type of exercise. • Almost everyone who exercises has his or her favourite workout playlist. You depend on the music for going that extra mile in your workout – be it pushing yourself to do that extra rep or increasing the number of weights you lift. But, the arms of your glasses almost always interfere with your earphones. • There are high chances that your glasses may break during the workout. From your workout partner elbowing you in the face to dropped weights on your glasses, the possibilities are plenty. And, replacing glasses can burn a huge hole in your pocket. Why Lasik Is a Perfect Solution? • Lasik eye surgery is a one-time investment to perfect vision. You save thousands of dollars on lenses, frames and even contacts and contact solution and fees of eye checkup visits. You also don’t have to worry about breaking your pair of glasses or the hassles of maintaining your pair of contacts. • Your nighttime vision is improved and you can see a whole lot better during the night. • You no longer need to be self-conscious about bulky frames or constantly pushing your glasses back in their place as they slide down due to sweat. • You can enjoy your favourite sport without worrying about any issues related to sports and eyeglasses. So don’t let glasses limit you during your workouts whether you prefer the indoors or the outdoors. Choose Lasik so that you can enjoy your workout without the hassles of eyeglasses!